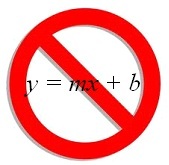 I want to ban all use of the slope-intercept form, y = mx + b, as a method for writing the equation of a line! The reason is that using the point-slope form to write the equation of a line is much more efficient and quicker. Given a point and the slope, m, it is much easier to substitute into at which point you are done; you have an equation of the line. Algebra 1 books, for some reason that is beyond my understanding, insist using the slope-intercept method. You begin by substituting the slope into and then substituting the coordinates of the point into the resulting equation, and then solving for b, and then writing the equation all over again, this time with only m and b substituted. It’s an algorithm. Okay, it’s short and easy enough to do, but why bother when you can have the equation in one step? Where else do you learn the special case (slope-intercept) before, often long before, you learn the general case (point-slope)? Even if you are given the slope and y-intercept, you can write . If for some reason you need the equation in slope-intercept form, you can always “simplify” the point-slope form. But don’t you need slope-intercept to graph? No, you don’t. Given the point-slope form you can easily identify a point on the line, , start there and use the slope to move to another point. That is the same thing you do using the slope-intercept form except you don’t have to keep reminding your kids that the y-intercept, b, is really the point (0, b) and that’s where you start. Then there is the little problem of what do you do if zero is not in the domain of your problem. Help me. Please talk to your colleagues who teach pre-algebra, Algebra 1, Geometry, Algebra 2 and pre-calculus. Help them get the kids off on the right foot. 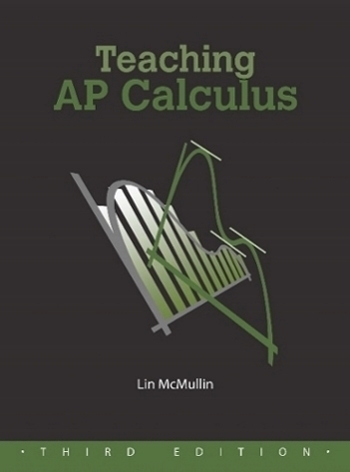 Whenever I mention this to AP Calculus teachers they all agree with me. Whenever you grade the AP Calculus exams you see kids starting with y = mx + b and making algebra mistakes finding b. We public school teachers are forced to teach to the “common core curriculum” and are rated on our students’ ability to demonstrate understanding of such. The common core curriculum for grades 8 and 9 (at least for New York) lists slope-intercept form as a performance indicator. Our hands are tied; we must teach it, or risk a lower evaluation by our districts. I agree 100% with your post however. Can you influence the common core curriculum writers? I have no influence over the Common Core – wish I did. I do not know just exactly what the Common Core will require. I certainly hope they will NOT require students to do things or solve problems by some specified method. A correct answer found by any correct method, with supporting work, should receive full credit. Otherwise they will be penalizing students for doing correct mathematics. As I hope I made clear, I am not in favor of using the slope-intercept method as a way to write the equation of a line. Students should certainly know what the slope-intercept form looks like, know what the m and b stand for, and know how to graph directly from slope-intercept form. They should be able to change their answer into slope-intercept form (which I suspect will be necessary to recognize the correct multiple-choice choice), and also other forms such as Ax + By = C. But to force them to use such a clumsy method for writing the equation in the first place is ridiculous. I’m happy that the AP Calculus exams always ask for “an” equation of a line and take any correct form. Of course if the CCSS asks only multiple-choice questions, or if they accept any correct method, then using the point-slope method will work just fine. Let’s hope they do that. It isn’t Common Core’s fault; this is a part of almost all state standards, and predates the Common Core Initiative by several decades. If you want to blame an organization, blame the National Council of Teachers of Mathematics – but remember they are just trying to help us teach the way we’ve been teaching math for centuries. For that matter, remember that “Common Core” does not write curriculum; the textbook writers do that. Get with NCTM & the publishers if you don’t like “Common Core problems.” As for the S-I Method, I rather agree, but now you’re fighting with the graphing calculator manufacturers as well!